I am not really a boss. I am called a Senior. They call me a mentor and a coach. It’s the new fangled way of describing a line manager I guess. Whichever way you look at it I have staff under me. I have to lead them, approve their leave and even give them permission to go home early if they wish. Last week one asked me, by email, if he could go home 30 minutes early to coach his daughters soccer team. 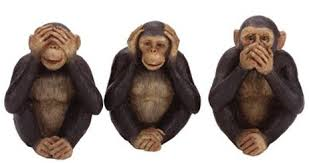 I emailed a reply that went along the lines of – I am the three monkeys. He didn’t get it so I sent him the pic below. He gave me a wry grin. I am sure he was thinking that I was a bit left field, never mind that I am deaf too. Regular readers of The Rebuttal will know that I have been quiet of late. That’s because I started a spanking new job with Australia’s most important disability program. The job started with a week of full on training, 9 am til 5 pm. I can tell you I was bushed at the end of it. There was so much information to cram in. Legislation, processes, flow charts, reviews, planning, assessments, computer systems, case studies and so on and so on. All of this through two sign language interpreters. My eyes and head were bursting at the end of the day. I thought it would end there but it didn’t. They decided, because there were a few system glitches, that we would all stay in training for another week. This was Thursday and they needed interpreters full time starting Monday the following week, for five days from 9 am til 5 pm. If you are a reader from overseas I can tell you that in Australia supply and demand of interpreters is such that organising interpreters for such intensive training, and at short notice, is nigh on impossible. But somehow with the brilliant Auslan Services and some flexible interpreters willing to change their schedules we managed it. First big challenge of my new career met with aplomb. So another week of training. Another week of cramming. Another week of intense focus on interpreters from 9 am to 5 pm. I was pretty much exhausted by that time and I had not even started the job proper. But on the plus side I was beginning to develop rapport with my new team mates. I began sussing out which were the easy ones to communicate with. Who was easy to lip-read. Which were flexible. Which were a bit more closed and needed guidance to feel comfortable communicating with me. It was a good time to suss this out. It’s funny, because this is probably something unique to the deaf employee. It’s not a straight in and start talking sort of thing. You have to prepare and educate your team mates. Importantly you have to troubleshoot and identify possible challenging teammates who you will need to work extra hard to communicate with. Thankfully there are not many of the latter. My new team mates are wonderful. So training complete it was off to the office to begin the job proper. I was very apprehensive. I did not really know what to expect. I was a Senior with higher responsibilities. I had no idea how the office would operate, how the team was structured, what communication systems were in place already. I was going in blind so to speak. To top this off in the office were several new team mates who had been on board for a while. I had to get to know and suss out these teammates, just like I had done with my team mates who attended the training. I was uncharacteristically nervous. The team were great. They all made the effort to communicate whatever which way. Email, writing, lipreading, typing out on the computer, they were all just brilliant really. Here was me the senior and they were taking the lead and making every effort to meet me half way. It is a very rare thing. It made my job that much easier and settled my nerves straight away. But it was not all plain sailing. The team had this strategy of calling impromptu meetings. Someone would have an issue to discuss and it was on. It might go something like this. “Listen up people I have a message from the head office we have to discuss how to deal with the delay in delivery of new laptops …” And there in the middle of the office floor would begin a full scale meeting. Of course there was no way that I could follow and I began to glance about me anxiously every-time someone stood up. I made a note that I would need to talk about this with my manager because it was obviously disadvantaging me. I understood the need but I was obviously missing out on vital information. Just as important, the team were missing out on the benefits of my experience as I was unable to contribute anything to the discussions. I was just about to head into my managers office to discuss this when they called another impromptu meeting in the middle of the floor. I must have looked really stressed because what followed was something I have never had happen in 30 years of my work life. A colleague sat down next to me with her computer and began typing out everything people were saying. And she was as good as any live captioner I have ever seen. She was so fast I was even able to stop people occasionally and add my two bobs worth. It didn’t stop there. There was another meeting half an hour later and someone else volunteered to scribe. During the week there were several more impromptu meetings and every-time, and without being asked, someone volunteered to type out the discussions. A proactive workplace. I can tell you I have had wonderful workplaces in my career but I had never experienced that. I was very grateful and humbled. Even now as I type this I get a little teary. It is just a wonderful and very rare thing. I entered the second week of life in the office with a warm glow thinking how lucky I was. Then the boss hit us with a bombshell. Once again she was sending me and a few others to training for four days, starting the next day. I asked her how she thought I was going to get interpreters at such short notice, or even captioning for that matter. “Do your best”, she said with a laugh, ignoring the filthy look I was giving her. And some how I managed it. Overnight, with assistance from the brilliant Barney and Jason from Bradley Reporting, I managed to secure live remote captioning for virtually every session. Where captioning could not be made available the terrific Auslan Services filled the void, somehow finding interpreters either live or by Skype. Yes, I am unashamedly advertising the services of these brilliant agencies. They go above and beyond the call of duty to assist. Do not underestimate the importance of attitude and service when booking communication support. All deaf professionals need it to be spot on and these two agencies consistently meet the challenge. Then I was allocated my staff. How lucky I was. Two were hard to lipread, and one really easy. Of the two that were hard to lipread one preferred communicating by email anyway. Short and sweet communication just like me. The other preferred face to face but we overcame that using the iPhone voice recognition technology. We just go into Notes, touch the littler microphone on the keypad to launch the voice recognition and she speaks into the phone. What she speaks comes up in text. It is surprisingly accurate. Sometimes it turns off at the wrong time but she just patiently touches the microphone again and we are away. You would be surprised how fluent the conversation is between us. And whats more we have a record of everything we agreed in notes. It is really only good for one on one meetings but it is brilliant. I know some people are asking – where are the interpreters. Well as an office operates, unless you have one on duty full-time, interpreters simply cannot be available all the time. So you have to improvise. That’s exactly what my team mates do. Whether its using technology, volunteering to scribe, using email, sending me texts or chatting on Yammer or Skype, they find a way. And that is life for the Deaf Professional today. Years ago none of this would have been possible. Attitudes were different and technology non existent. But not now. That’s why I can be a boss now. But how lucky have I been to come into a team who meet me more than halfway at every opportunity. It’s brilliant! The world is made up of beautiful people, more than we care to acknowledge!